The Monrovia Historical Society (a separate organization from MOHPG) was formed in 1979 to assume the care and maintenance of the George H. Anderson House Museum — a fully-furnished 1886 home depicting family life of the time. The Anderson House was painstakingly restored by volunteers and passed from the Friends of the Monrovia Public Library to a newly created Historical Society. But, membership in the Society declined over the years and founding members passed away, and the Society itself became dormant. Sadly, with fewer volunteers it was no longer open to the public. The Anderson House Museum as it appears today. George H. Anderson lived in this house for almost all of his nearly 88 years. The home originally belonged to his parents, John and Lizzie Anderson. John was active in the business life of Monrovia, serving on the City Council in the early days. He died in the home on January 25, 1902. Lizzie Anderson continued to live there with her son George until her death on April 18, 1912. George, who never married, lived in the house until his death on July 10, 1974. Title to the house was deeded to the California Community Foundation which was administered by the Security Pacific National Bank. The Foundation gave $9000 to the Friends of the Monrovia Library in order to purchase the house, and title passed to the Friends of the Monrovia Public Library on July 10, 1975, just one year after George’s death. 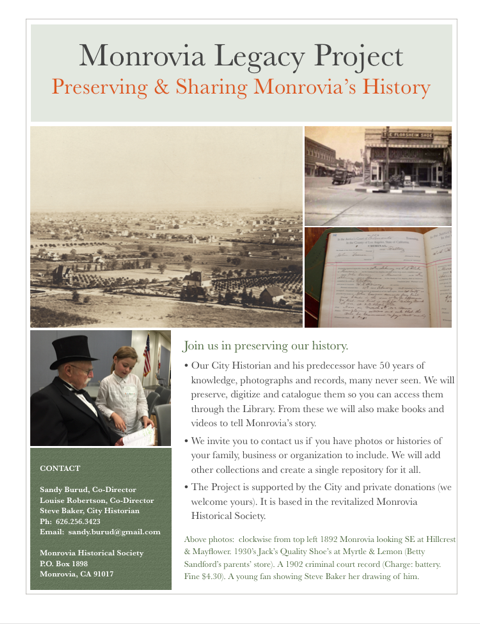 Ownership of the house was then transferred to the Monrovia Historical Society in December, 1979. 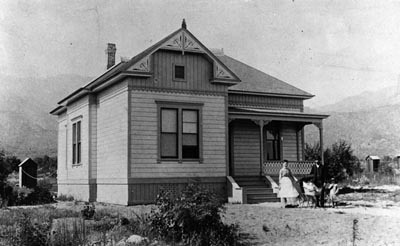 The Anderson House as it looked in 1886. Since then the Anderson House has served as an example of what a turn of the twentieth century home might have looked like on the inside. Furniture and other artifacts re-create the living environment from that time period. At the present time the museum does not have regular visiting hours. However, if you wish to make arrangements to view the interior, contact us.